Materials quantities for cement, sand, coarse aggregates and water necessary for per cubic meter of concrete and mortar differentiate with the mix design of the concrete and mortar relatively. 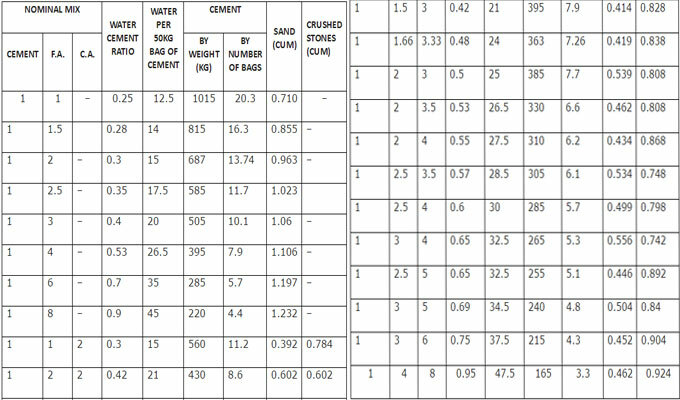 Given below, the predictable quantities of materials essential for per cubic meter of mortar and concrete toward different nominal mixes in a tabular form. 2. The table is created on the basis of the proposition that the voids in sand and crushed stone remain at 40 and 45 percent correspondingly. 3. Air content of 1 percent is anticipated. 4. For gravel aggregates reduce cement by 5 percent, raise sand by 2 percent and coarse aggregate corresponding to fine aggregate in mix. 5. There is no allowance in the table toward bulking of sand and wastage.